If you happen to awaken from your sudden Christmas Coma and find yourself in the midst of a Christmas SALE isle, do not fret this is completely understandable! Personally, I don’t know of anyone who can resist the 50% off post Christmas SALE. You see, the 5 days after Christmas make up the best Holiday SALES, because you are given the most amazingly discounted opportunity to stock up for next year, Christmas 2016! I know, I know if you are not the Mom of the year who has a wrapping room in her basement, it might be a bit difficult to think that far ahead of the game, but look at me… I’m a single Millennial and I too have caught myself pre-buying Christmas Cards and special wrapping for next year that I may have not been able to afford on my Millennial budget otherwise… Y not save money, right?! If you are conscious about your pocketbook, you could even go ahead and pick your holiday theme for next year, make some purchases (like stockings and ornaments) you like this year, and save them for use next year! Those trinkets won’t perish, and you will find yourself ahead of the game and saving yourself 50% to 70%… Y Not Save?! Pharmacies like CVS and Walgreens, Target to Michaels and TJ Maxx are all offering 50% Off. So, if I were you, I would head on over to your nearest Christmas super center and check out what is up for grabs… Get creative and trust me you will not regret it! 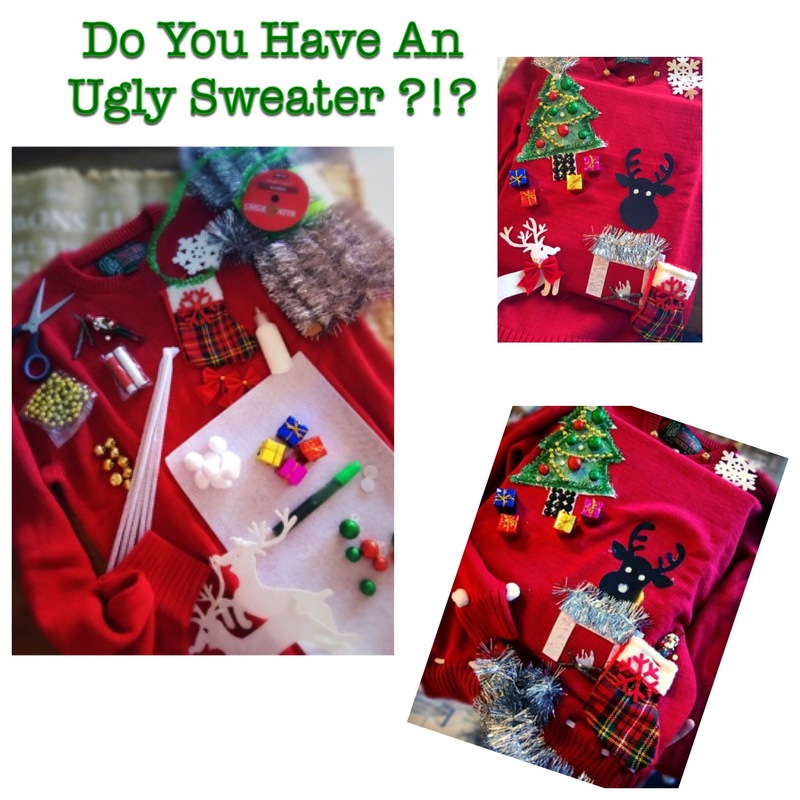 I have 3 words for you… Ugly Christmas Sweaters! This is exactly what I decided to do with all the SALES I came encounter with this year and I came out winning! You could even buy stuff on SALE to make the sweaters and personalize them, to gift to your friends and family next Christmas. Let’s face it, you have 12 months to work on them, so there is plenty of time to make this crafty project happen and you will 100% get smiles from even the ‘Grinchiest’ of your family members, guaranteed! Make sure to snag up plenty of glittery and tacky ornaments in the SALE section today… In case you are thinking you really can’t spend anymore after this past weekend… some ornaments you will even get deals on, like 50 or 75 CENTS! Soooo NO Excuses! Always have Glitter on Hand, it will 100% necessary in this endeavor! I bought Silver Tinsel this morning for 99 cents at Walgreens and it worked out amazingly! Y? Because it adds a 3 dimensional aspect to your sweater and since it shines, its a MUST! Rhinestones, Beads and Christmas Ribbons are always good to have on deck too… OH, I almost forgot… if you happen to come across some puffing pompoms and mini bells, make sure you get some of those! See that is the thing about this whole ugly sweater craze, there is no rhyme or reason and no right or wrong, so anything you come with, that you design will be amazing and so very fitting, because YOU made it! In all honesty, I spent my entire afternoon feeling like a kid in art class again. I giggled like a schoolgirl while sipping on a cappuccino and designed my own sweater… It’s a great time and well worth it, especially with all of the deals out right now! P.S. If you have been thinking about throwing a ‘Ugly Sweater Decorating Party’ next Christmas, definitely make sure you stop into some stores tonight and grab your favorite Christmas trinkets for the sweater party… Just think about all the $$$ you will save!